Posted in Diet & Nutrition on April 15, 2012. Last modified on April 23, 2019. Read disclaimer. Steeped in Aaron Copland's "Rodeo" music and Norman Rockwell type imagery, could anything be more "American" than the "Beef -- it's what's for dinner" marketing campaign of the 1990's? The fact is, making meat the center of our meals is a relatively new lifestyle shift -- occurring around the mid 1900's, when refrigeration became common, distribution channels were perfected and meat became more affordable. Before that, our ancestors ate more of a plant-based diet, where meat was used to compliment the vegetables and grains -- rather than the other way around. Thanks to books like Diet for a Small Planet (1971), The McDougall Plan (1983), and Diet for a New America (1987), attention was called to the environmental, social and health consequences of producing and eating so much meat. And as a result, eating a more vegetable-based diet is, once again, becoming more widely accepted. The DASH acronym stands for Dietary Approaches to Stop Hypertension and was developed by the National Heart, Lung, and Blood Institute as a tool for lowering high blood pressure. Moderate consumption of red wine is another element of the Mediterranean diet that seems to draw a lot of attention. Another characteristic of traditional Mediterranean-style eating is that foods are prepared and seasoned simply rather than with sauces and gravies. Unfortunately, as the modern Mediterranean diet has become more like ours in recent years (to include more saturated fats and cholesterol with less monounsaturated fats), their rates of heart disease have also risen. The term vegetarian encompasses many different meanings, from vegans who avoid all animal products, to lacto-ovo vegetarians who include milk and eggs (which, incidentally, is the most common form of vegetarianism in the US) and even partial or semi-vegetarians who include small amounts of red meat, poultry and fish. Nutritionally, a vegetarian diet differs from the traditional American diet in that it includes more dietary fiber, complex carbohydrates, magnesium folic acid, Vitamins C and E, potassium, carotenoids and other phytochemicals. 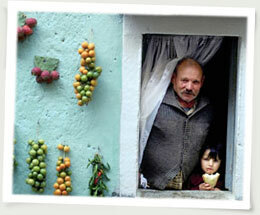 What does a well-balanced vegetarian diet look like? 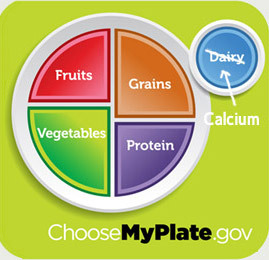 The ChooseMyPlate graphic (which replaces the food pyramid) developed by the USDA can be applied to vegetarian meal planning almost exactly as it would be used for "normal" healthy diet with one substitution which we first found suggested at http://www.vrg.org/nutshell/MyVeganPlate.pdf. Just replace the word Dairy with Calcium. calcium: sources include dark green leafy vegetables like collards, broccoli, turnip greens, bok choy or mustard greens; almonds, beans and soy products like tofu; calcium-fortified cereals, soy or rice milks and juices; blackstrap molasses. Also prevalent in milk products. 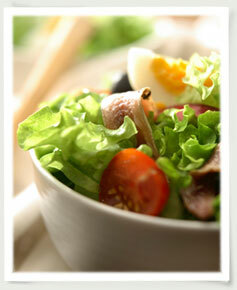 protein: beans, nuts, whole grains. Also prevalent in milk products and eggs. zinc: dried beans, pumpkin seeds, wheat germ. Also prevalent in milk products. vitamin b12: vegetarians should take a supplement or consume fortified foods since vitamin B12 is found naturally only in animal-based foods. Also prevalent in milk products and eggs. Having spent a lot of time in Italy and Greece, I think that HOW Mediterranean meals are eaten may be as important as WHAT is eaten. They put a wonderful focus on fresh foods, enjoyable activities, unhurried meal preparation and relaxed sharing with family and friends.